Clean sweep, but Grail VS Wanda is SUPER close. Just so that people don't downplay Thanos; When Odin fought him, he was in his own realm (Odin's) and he had Gungnir and was amped, yet Thanos still had the strength and durability to withstand his attacks and hold his own, yes Odin does beat Thanos under normal circumstances, but not 10/10 or 9/10, he beats him only solidly, like 6.5-7/10. Yeah, it's a hard fight but Odin does win. What exactly do you want to "go" for? And Havok isn't a copy of Black Bolt, so your moniker of "fake Black Bolt" is inaccurate. Excuse me, Thanos doesn't beat Odin. @soratoumiga only beats extraterrestrial demons, universal abstracts and incredibly powerful abominations because of the nature of her powers. It's like Red Hulk beating Silver Surfer makes him more powerful than Green Hulk and Thor who are curbstomped in a fight with Silver Surfer. Or Ghost Rider's penance stare making him as powerful as those he can defeat by using it. Raven defeated Trigon and contrary to the claims of some fanboys, she is much weaker than Superman and Wonder Woman despite beating someone that can solocurbstomp the entire Justice League. Anyway, Wanda can clap Grail bruh, she can barely solo JLA bruh. Did I mention that grail is an amazon and a new god? You didn't, but that's great. And what if Wanda's powers backfire? That doesn't happen anymore. At all. She can control it perfectly. By time freezing/molecule immobilizing. Or she just dodges her attack. Does what? Stops time? Where did she do that? And Wanda can clearly control time, so it wouldn't affect her much. The only New God which has shown the capability to do that is Darkseid, and only in New 52, where he is massively more powerful than him Post-C counterpart. The only thing Grail did, so far, was just beating JLA, a mind controlled Darkseid and some brute force feats here and there. Wanda has easily countered such things as super strength/speed. And when she fought Thor in Uncanny Avengers #4, she froze time almost immediately. She likely did use ALE, but it's not even in this fight, so we can't use it. Grail won't kill her immediately for reasons I have listed before. And she likely can't. LOOOL DID YOU REALLY JUST CALL HAVOK BLACK BOLT? You didn't read the comic, the fallacies are all over the place in your post. 1) That's not Black Bolt, that's Havok. 2) Previous to that scene, Wanda was mindraped and exhausted because of that. 3) Previous to that, Wanda was also drained by Rogue, so her powers were at the lowest. 4) Thor was bloodlusted and his mind was controlled by a ruthless villain, who wants nothing more than Wanda to suffer. Need I go on? Wanda, at her weakest still managed to handle Thor who was going for the kill and wasn't holding back. Do you read Wanda comics? On a daily basis, she fights numerous extra terrestrial demons, universal abstracts, incredibly powerful abominations and what not anymore... She has fought opponents worse than Grail, and knows what to do in a situation against villains like her. Lol, what? God Blast would probably do a little bit of harm against Wanda. She would casually brush it off, based on her feats, and also, him using God Blast does not equal him not holding back. I usually use that website... Idk any other, you can buy the issue online, I guess. 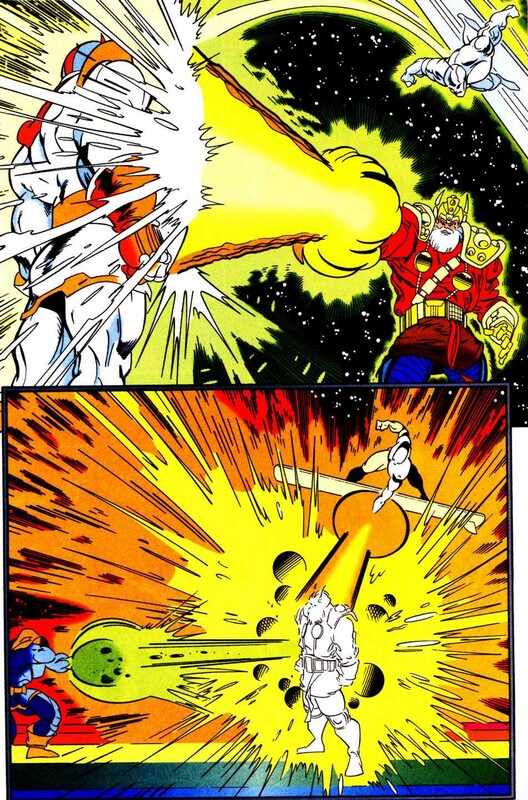 Just thought I'd mention the fact that Thor not using the Godblast doesn't mean he's holding back. I just go on the website, and everything's already set up, I can change the pages and normally read it. I don't know if you have any issues, if so try another source. Because that's not his opening move in every single battle. Duh. Because it's not his first move, it's not his second move, he doesn't use it more often than he does. @soratoumiga the only reason that Scarlet Witch beats extraterrestrial demons, universal abstracts and incredibly powerful abominations because of the nature of her powers. It's like Red Hulk beating Silver Surfer makes him more powerful than Green Hulk and Thor who are curbstomped in a fight with Silver Surfer. Or Ghost Rider's penance stare making him as powerful as those he can defeat by using it. Raven defeated Trigon and contrary to the claims of some fanboys, she is much weaker than Superman and Wonder Woman despite beating someone that can solocurbstomp the entire Justice League.